A watershed is the area of land where all of the water that is under it or drains off of it goes into the same place. Our natural watersheds and water sources are consistently polluted by individuals and corporations. Most pollution is not intended- it occurs by accident when technology malfunctions or proper oversight is overlooked. Although we have state and federal laws which prohibit water pollution, these laws can only be enforced when citizens agree to hold each other responsible by reporting violations and assisting polluters in adopting sound water management practices. The Friends of Hurricane Creek hope to work with the Alabama Clean Water Partnership to create a Watershed Management Plan for the watershed in the coming year. Hurricane Creek is part of the Upper Black Warrior River watershed (Subbasin HUC8 Black Warrior River) as classified by the EPA. (USGS Cataloging Unit: 03160112, 03160113) Its interests are represented by legislators in the AL 4th, 6th, and 7th Congressional Districts. Upper Black Warrior Tributaries include: Big Yellow Creek, Binion Creek, Blue Creek, Carroll Creek, Cripple Creek, Davis Creek, Hurricane Creek, Mud Creek, North River, Pyro Creek, Rock Creek, Valley Creek. Hurricane Creek’s watershed is primarily composed of clays, sands and limestones . The rest of the watershed is composed of the Upper Pottsville Formation of the Pennsylvanian Age. Hurricane Creek’s watershed is divided into different ecoregions, each having different characteristics. Shales Hill Ecoregion describes the mid and upper parts of the watershed. Its topography consists of extensive hills with strong slopes . Impermeable shale, siltstone and sandstone bedrock are part of the geology. The soils are silt loams with a silty clay or clayey subsoil. Falls Lines Hill is the lower part of the watershed. It has many slopes, but the sediments are more loamy and sandy . Section 303(d) of the federal Clean Water Act requires states to develop a list of impaired waters ("303(d) list"). A water is considered impaired if a) the current water quality does not meet the numeric or narrative criteria in a water quality standard or b) the designated use that is described in Alabama Administrative Code is not achieved. A documented methodology describes the approach used to list waters as impaired. Once a watershed is described as impaired, a TMDL management plan is put into place to improve the water quality over an extended time period. A TMDL is a Total Maximum Daily Load, which specifies the amount of sediment, pathogens, and chemicals allowed in a watershed given its classification. Hurricane Creek is currently listed as an impaired stream on the state of Alabama's 303 (d) list. State agencies and federal agencies are involved at different levels in this designation and implementation process. Depending on the effectiveness of plan implementation, either the EPA or the Alabama Department of Environmental Management oversees the process. Alabama is an "authorized" state, meaning that it is authorized by the EPA to administer state environmental law in lieu of most federal environmental laws. This is consistent with Alabama statutes that created ADEM, and which express legislative intent to have federal environmental laws administered at the state level. The scope of the Department's statutory authorities is determined by Title 22 of the Code of Alabama 1975. These are the only laws under which ADEM can write regulations. Alabama is in Region 4 of the EPA. According to the 2008 EPA Region 4 snapshot of Alabama's TMDL regimen, the top three barriers to TMDL Development are changing federal requirements, third-party lawsuits (e.g., the “daily loads” ruling), and inadequate resources for data requirements. The top three barriers to TMDL implementation are inadequate resources for BMP implementation for NPSs, inadequate resources for follow-up monitoring, and implementation of low-level targets for which the technology is still unavailable. The Alabama Water Quality Report to Congress for 1994-95 identified 19 miles of Hurricane Creek as not supporting its designated use of Fish and Wildlife due to metals, low pH, siltation, and organic enrichment/D.O (ADEM 1996). This information qualified Hurricane Creek for inclusion on Alabama’s 1996 303(d) list. The listing decision was based on biological assessments that indicated impairment of fish and benthic macroinvertebrate communities within the watershed. The sources of these impairments were attributed to surface and subsurface mining, and mill and mine tailings. Additional water quality sampling resulted in three waterbodies in the Hurricane Creek watershed being placed on Alabama’s 1998, 2000, and 2002 303(d) lists. The mainstem of Hurricane Creek, from the Black Warrior River to its source, was listed as impaired due to turbidity, pathogens, aluminum and iron. Little Hurricane Creek, a major tributary that drains the southeastern portion of the watershed, was listed for aluminum, arsenic, copper, chromium, iron and pathogens. North Fork Hurricane Creek, another important tributary that drains from the northeast, was identified as impaired for aluminum. The Alabama Department of Environmental Management (ADEM) attributed the metals impairments to acid mine drainage (AMD) from abandoned surface mines. The turbidity impairments have been attributed to mining, silviculture, and land development, while the probable sources of pathogens are nonpoint runoff from failing septic systems, pastures and croplands, or residential and urban area. Although Hurricane Creek is not currently listed for pH on Alabama’s 303(d) list, the water quality data indicate that some tributaries of Hurricane Creek, especially Blanchet Branch and Weldon Creek, do not meet the pH requirement. This document is our most current watershed health document which gives us a direction in the efforts to monitor water quality at Hurricane Creek so that it remains safe for its intended use. FOHC is currently pursuing efforts to create a Watershed Management Plan for Hurricane Creek. If you'd like to learn more about watershed management and monitoring impaired streams, including out own, the following documents might assist you in investigating the Hurricane Creek watershed and watersheds more generally. Monitoring station at bridge near Keene's Mill Water sampling conducted at Latitude: 33.19996 N Longitude: -87.44683 W , HUC 11: 031601120504 between 1999 and 2000. Results for Cottondale Creek. Citizen's Guide to Black Warrior River Watershed Created by Alabama Water Watch. An excellent, reader-friendly guide to the watershed and water monitoring. ADEM Jan. 15 2012 finds Jamestown Villas in violation of code Our Creekkeeper keeps an eye out on sediment dumping and development violations. This Division describes the organization of the Environmental Management Commission and the Department; prescribes methods the public may use to obtain information or make submissions or requests; describes the procedures for the submission, consideration and disposition of petitions for declaratory rulings; provides for permit application forms and the assessment of application fees. ADEM Division 2 Environmental Management Commission This Division prescribes the rules of procedure for hearing appeals of administrative actions of the Alabama Department of Environmental Management; petitions for rulemaking; and, rules of procedure for meetings of the Alabama Environmental Management Commission. ADEM Division 5 Uniform Environmental Covenants Program These regulations are promulgated to establish minimum requirements governing environmental covenants pursuant to the Alabama Uniform Environmental Covenants Act, Code of Alabama 1975, §§35-19-1 to 35-19-14. ADEM Division 6 Volume 1 Water Quality Program (NPDES) This Division prescribes regulations for development and implementation of water quality standards and water body use classifications for all waters of the State; prescribes conditions relevant to the issuance of permits to include effluent limitations for each discharge for which a permit is issued; and, such other rules as necessary to enforce water quality standards. Also, this Division incorporates regulations for the State's Underground Injection Control (UIC). ADEM Division 6 Volume 2 Water Quality Program (UST) This Division prescribes regulations to establish construction, installation, performance, and operating standards for underground storage tanks, as well as the administrative procedures for disbursements from the Alabama Underground and Aboveground Storage Tank (Tank Trust Fund). ADEM Division 7 Water Supply Program This Division prescribes regulations regarding the purity, potability, wholesomeness and physical quality of water which may affect the comfort, public health or public well-being. A local watershed is as healthy as its citizens require. Current environmental law places the responsibility for water monitoring on local groups and citizens. Please join us in keeping our waters and streams full of life. This is a bid for clearing storm debris from the banks of Hurricane Creek. We are concerned about the provisions which involve operating heavy machinery on fragile stream banks. Every citizen involved in water monitoring can help a community understand the conditions of local watersheds and streams. AWW has pioneered excellent work in our state. Clean Water Network Use Analysis Attainment Toolkit The toolkit, which provides guidance on the UAA process, whereby a state may remove or downgrade a water body’s designated use for specific reasons, was a clean water bestseller. In many states the list of waters requiring clean up because they fail to meet water quality standards continues to grow, while most state budgets for environmental protection are not keeping up. Clean water advocates need to be aware of the efforts to remove waters from 303 (d) by weakening standards rather than to actually fix the water quality problems. The UAA Toolkit was designed to tackle this problem head on. Watershed, in order to meet or exceed Alabama water quality standards. The Plan supports this goal by recommending educational strategies, supporting existing programs that serve to reduce non-point source pollution, and identifying areas where additional research and monitoring are needed. Clean Water Network National Directory The 2010-2011 draft directory for organizations and leaders involved in clean water management and conservation. 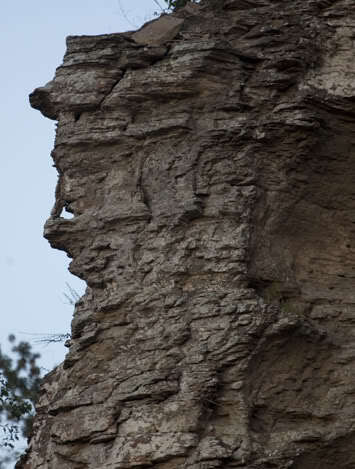 Profiles in the cliffs along Watson's Bend as photographed by John Wathen, 2012.